Handmade pottery with organic, hand carved motifs. A modern interpretation of art-nouveau themes. 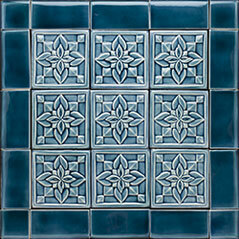 Consult with me about custom decorative tiles to add flare your bathroom or kitchen decor. Sleek, modern style with a reference to the classics , these pieces will fit into any decor. I began working in clay as a child and loved it. Eventually my passion for clay led me to study ceramic design at Wesleyan University in Connecticut. After receiving a degree in art I served as an apprentice for two well known artists in Cambridge Massachusetts. What I learned there allowed me to eventually open my own studio in 1987. For the last thirty years, I have been producing and showing my own lines of work both nationally and internationally. Currently, from my studio in Oakland, Ca. I work with designers, architects, and individual clients to create unique pieces of art for both public and private spaces. It is my greatest pleasure to make works that bring beauty into people's lives and enhance their everyday rituals and experiences.